It is the middle of October and leaves are about to past the peak of color and pumpkins begin to make their appearance at the local farmer’s markets, just as Summer seems like a distant memory. And with the autumnal changes pumpkin spice-flavored treats make their appearance just about, everywhere. 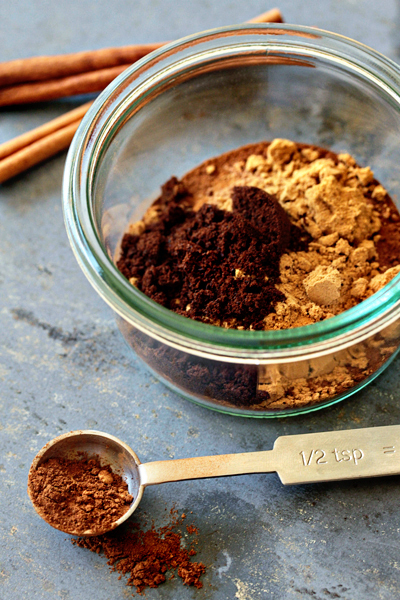 You can always buy a commercially prepared pumpkin pie spice, but it is just as easy to make at home with the “warm” spices that you already have on hand.This recipe is a blend of “warm” spices such as: cinnamon, nutmeg, cloves, allspice and mace. Pumpkin pie spice adds a nice extra “pumpkin” taste to pumpkin pie or a pumpkin flavored latte. Measure all of the spices into a small air tight jar, like a Weck jar, and seal the jar up. Shake the jar until the spices are well mixed. Label the jar and store it in the pantry as you would any other spice, for up to 1 year. This entry was posted in Spices and tagged Spices, Weck Jar. Bookmark the permalink.